This week's Intuitive Tuesday card was the Queen of Wands, a card describing the qualities of a strong and vibrant female energy. Is it you or possibly someone else in your life? Today’s card is The Devil and I believe there is a message here for each of us. I selected it today from the Gilded Tarot deck by Ciro Marchetti and Barbara Moore. In its upright position, among other things, The Devil can symbolize being stuck, imprisoned by your own thoughts and desires, a narrow materialistic view of life, depression, burden, misery and the need to see things more clearly. It can also indicate the need to confront your personal demons. In my training to be a life coach, we studied how to confront what was called, The Saboteur, which could be interpreted as a personal demon. The Saboteur's voice refers to the ongoing stream of messages that we hear (sometimes unconsciously) that can direct our lives. The voice can be a composite of things you tell yourself, and messages you have heard throughout your life from parents, teachers, caretakers, friends, etc. The messages can be either positive or negative, and if you listen to and believe them, they can and will direct your life. With my coaching clients, I can tell when their inner light is shining. Their voice is passionate, optimistic and full of life. They radiate with the possibilities that life holds for them. This would be like the Queen of Wands energy that I talked about in this week's Intuitive Tuesday post. "You couldn't do something like that?" "Do you think you are special or something? "You just aren't good at math." If you've listened to and believed these thoughts and never questioned their validity, you know what it's like to be stuck in the energy of The Devil. Remember that the first times you heard these messages, you were probably growing up and the people saying them may have been important (possibly well-intentioned) people in your life. And be careful with these messages because they can sound logical and true...or at least at some point in your life, you believed them. Perhaps you've never gone back (in your big grown up body and mind) to determine if they are still true for you. Today's card invites you to listen to your own internal dialogue. What do you hear? What messages are there? Are they true? How do they impact you and your life? 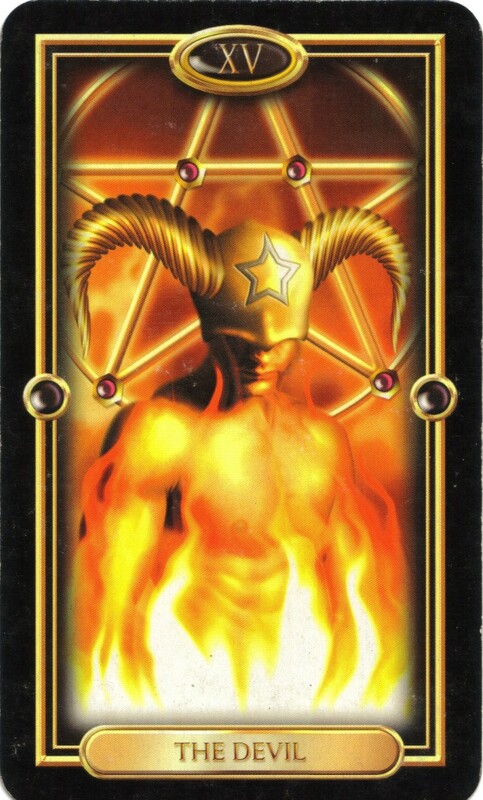 Pulling The Devil today may be drawing your attention to your inner demons, but remember that you have the power and energy of Intuitive Tuesday's card, The Queen of Wands, to face and overcome your personal demons...and NOW is the time to do it. Sorry I didn't prof-read my posting before I hit send. Even the first part of your directive to us is so hard for me. To stop and listen. I tend to have a lot of inane chatter. I do have both a cheerleader and a saboteur. When I do stop. to. listen. I can tell which one it is. It's hard to stop and listen to the voice inside sometimes. So much of my thoughts I think are habit. I'm going to keep myself in check this week and listen to what I'm telling myself.